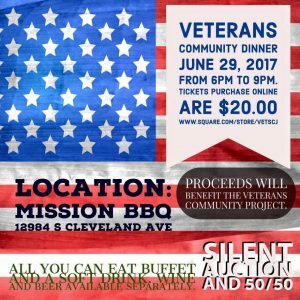 Jim Stevens, Lead Coordinator of the Vets Visiting Vets Program in Naples, Florida is scheduled to be a guest speaker at the Veterans Tiny House Fundraiser in Ft Myers, FL sponsored by the Veterans Community Project on June 29, 2017 at the Mission BBQ restaurant at 12984 S. Cleveland Avenue. The all-you-can-eat BBQ dinner and silent auction is from 6:00 pm to 9:00 pm and tickets are $20 per person. All Proceeds benefit the Veterans Tiny Home Community Project. 1) We are looking to build a veteran’s community. 2) to educate about the tiny home community. 3) to raise funds to build our veteran’s community. Come meet Cornerstone Tiny Home Builder George Tice the only builder in Florida who is certified to build a Florida Code Compliance Tiny Home. Jim Stevens, a Veteran himself, said, “Come out and support this wonderful fundraising project for our Veterans in need. They will have some great silent auction items, a 50/50 cash prize raffle, and more. Please visit www.square.com/store/vetscj for tickets today. You won’t want to miss it as they may be giving away something big to a lucky winner.